Ravenna, historically surrounded by swampy lands and very difficult to reach from the dry land, but looking onto the sea, was, because of its special position, at the centre of fascinating historical events. It was at first the capital of the Western Roman empire, then conquered by Theodoric's Ostrogoths and, finally, one of the most illustrious Byzantine cities in Italy, and still contains evidence of these three periods. The city's glorious history would seem to interrupt only after the 6th century, but we shouldn't forget Medieval Ravenna dominated by the Da Polenta (who received Dante as a guest) and, especially, we shouldn't forget today's Ravenna which, nowhere near content to be just an open air museum, is a very active cultural centre. If you think about Ravenna you unequivocally think about its mosaics, declared world heritage by Unesco as one of the highest expressions of this form of art. Among the most famous ../../img the starry sky of the Mausoleo di Galla Placidia, a small Latin cross-shaped building built in the first half of the 5th century. Its outer appearance doesn't even hint at the majesty of its internal decorations, exalted by the special lighting effect created by the slits closed by alabaster strips. The nearby Basilica di San Vitale, dating back to the 6th century is possibly the greatest example of Early Christian art, though being influenced, as is normally the case in Ravenna, by Eastern themes. The octagonal structure clashes with the classic centre nave with two side aisles layout; the cupola and the great niches still preserve Renaissance frescoes, whereas the mosaic decorations of the apses depict Emperor Giustiniano and Empress Teodora with their courts. The Basilica di Sant'Apollinare Nuovo, built in the 6th century and re-handled often, preserves, in its walls, the greatest mosaics that ever reached us untouched. The halfway strip depicts the theory of the Virgins and of the Magi, a typical example of Byzantine mosaic art. 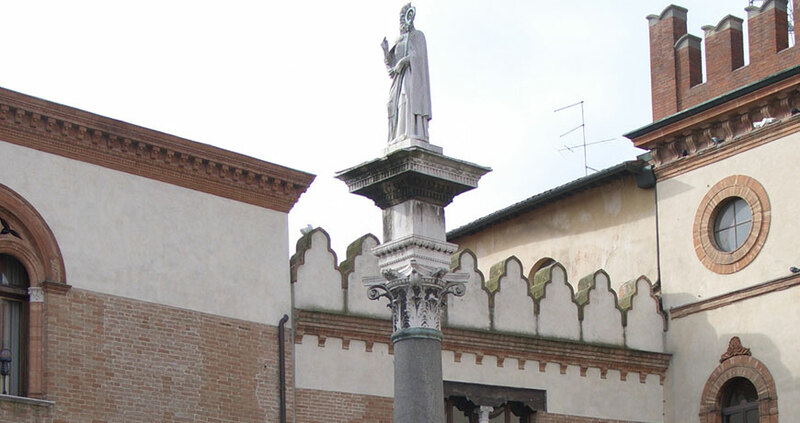 One of the most characteristic views in the city is the Basilica di San Francesco and its square. Built in the 5th century but heavily re-handled in the following centuries, the church has a three nave structure and hosts a crypt of the 10th century underneath the road's surface and for this reason constantly flooded with water. This is quite possibly where Dante Alighieri's funeral took place, in 1321. The illustrious poet rests in an adjacent building in neoclassic taste. A city beloved by so many both present and past artists, Ravenna offers its best in the summer, through the Ravenna Festival. Historical sights, during summer nights, become prestigious stages, hosting classic and modern musical events. Every year the Festival follows a different theme and stages collaborations between musicians and artists of word and gesture.